A new dash cam called MaxCAM, manufactured by Airmax Remote, aims to offer fleet operators with more accuracy and speed when processing insurance claims. The camera provides what the maker claims to be one of the fastest FNOL (First Notification of Loss) devices, which can reduce operational/fleet insurance costs by drivers involved in third party claims. 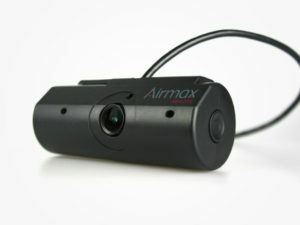 The MaxCAM can also provide a live-feed to operators within seconds, which the company claims can be used to improve driver behaviour and thereby standards of duty-of-care. Medium or low-risk events, such as near misses, can be stored to an SD card and downloaded up to eight week later. MaxCAM records GPS data at a rate of ten times per second, which the maker says compares to most devices offering just once per second. Airmax Remote added that failing to capture third-party information can inflate overall incident costs by 965%, turning a £1,000 bill into £10,650, while AXA Insurance has seen claims that should have been £5,000 spiral up to £50,000. Crucially, all data captured by the MaxCAM device is sent to a centralised server and, in the event of a collision, all data is transferred and admissible as evidence, should it be required to defend or mitigate an insurance claim. Airmax Remote added that the system can provide live incident reports, driver league tables based on safe driving behaviour, and real-time video footage and can also be fully integrated as part of Airmax Remote’s telematics system.